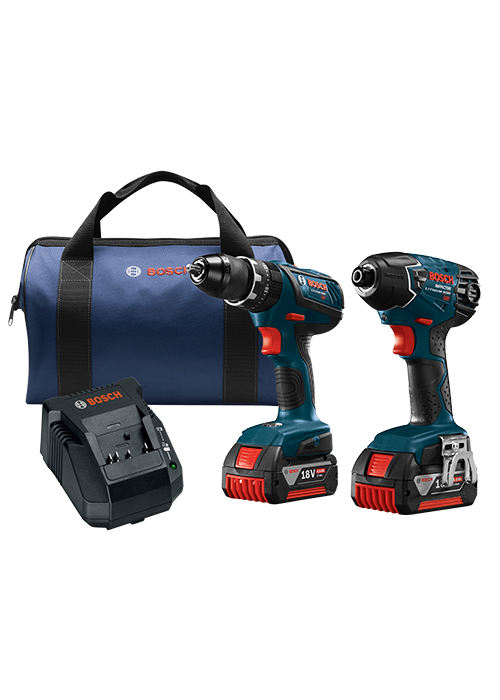 The Bosch CLPK237A-181 18 V Cordless Combo Kit provides tools that deliver the maximum amount of maneuverability plus power on a jobsite. This collection has two powerhouses that deliver top-flight muscle-to-weight ratio: the Bosch HDS181A Compact Tough 1/2 In. Hammer Drill/Driver and the Bosch 1/4 In. Hex Impact Driver. The hammer drill/driver features Bosch's innovative canned motor, which is more compact but provides the same power as conventional 18 V motors. It also has a heavy-duty chuck that prevents drill bits from slipping during high-torque applications, thanks to high clamping force. The drill produces powerful performance, with 600 In.-Lbs. of torque and two drilling speeds (0-1,700 RPM for high speed and 0-500 RPM for torque). It has the shortest head-length in class (7.6 In. long) and a weight of only 2.8 Lbs. The impact driver is designed for professional driving jobs, supplying 1,500 In.-Lbs. of torque, 2,800 RPM and 3,200 BPM – with a short 5.7 In. head-length. The included two 18 V 4.0 Ah FatPack Batteries and an 18 V charger ensure these tools run as long as the job takes.